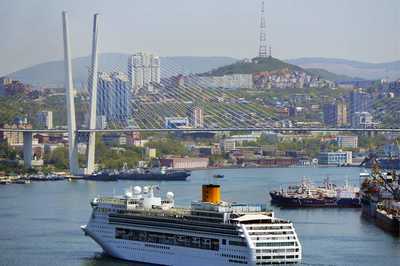 Almost 3 thousand citizens of 15 countries already have entered Russia with the e-Visa through the Port of Vladivostok. The simplified Visa regime came into force 2 months ago. With its help, the foreign visitors are able to obtain single entry business, tourist or humanitarian Visas, as was reported in the press service of the Ministry for Development of Russian Far East. Such regime supports the growth of the Russian Far East. In general, citizens of eighteen countries have the possibility to obtain the visa to Russia through the Free Port of Vladivostok. The document is being issued free of charge. From the beginning of the program, 1301 people have already crossed the border with new e-visas through the marine crossing point and the international airport Knevichi. Out of 2969 issued visas, 1532 were granted to the citizens of China and 649 citizens have already used them. 1017 visas were granted to the citizens of Japan, and out of them, 618 people have crossed the border. The new e-service is also popular among citizens of Marocco and Algeria. The application process for the Visa is extremely easy. It is enough to leave the request on a website 4 days prior to the departure date, and in case of the positive decision to fly into the country. Starting from 1st of January 2018, with the e-Visa, it will be possible to arrive not only to the city of Vladivostok but also to the Kamchatka and Sakhalin region. 11 checkpoints will be available for the travelers including railway control points (Pogranichny, Khasan, Makhalino), automobile control point (Poltavka, Turiy Rog), marine control pints (Zarubino, Petropavlovsk-Kamchatsky, Korsakov, and Posiet).